Construction is wrapping up at Columbia University Medical College's new Graduate and Education Building in Washington Heights. 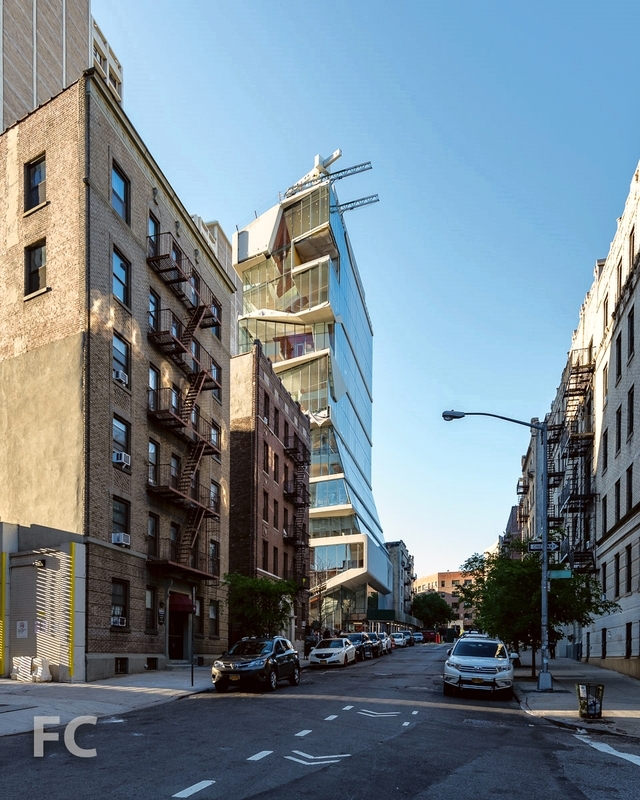 Designed by Diller Scofidio + Renfro with Gensler, the 14-story tower will house classroom, simulation and training facilities for the college when it opens this August. Dedicated on June 9, the building has been renamed the Roy and Diana Vagelos Education Center, after its initial donors P. Roy Vagelos, MD, a alumnus of Columbia’s College of Physicians and Surgeons (P&S), and his wife, Diana Vagelos, an alumna of Barnard College and vice chair of the Trustees of Barnard College. The building's iconic feature is the "Study Cascade," a south facing 14-story space, connected by a grand stair, with outdoor rooms and terraces to foster collaborative learning amongst students and faculty. Cement panels and wood clad the interior features of the "Study Cascade," while the exterior enclosure of floor-to-ceiling glass allows for open views of Manhattan and the Hudson River. Construction is slated for completion some time next year, with the goal of achieving LEED gold certification. Looking up at the southeast corner from Haven Avenue. South facade and outdoor stair. Close-up of outdoor stair and southwest corner. Ground floor south facade and outdoor stair. Building name signage at the southeast corner of the lobby. Ground floor spandrel glazing at the east facade.